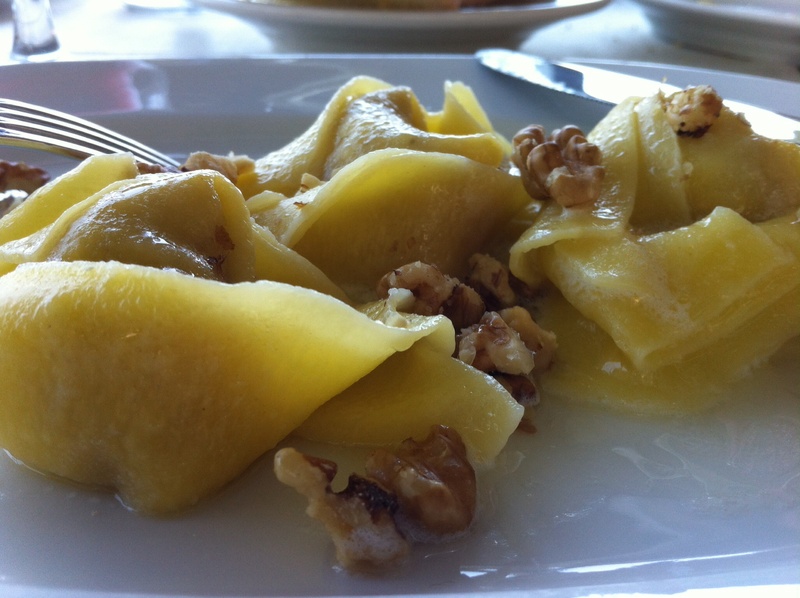 The little Umbrian town of Spello is fortunate to have many restaurants. Some are more upmarket than others but they all have one thing in common; regional, seasonal dishes and local wines. 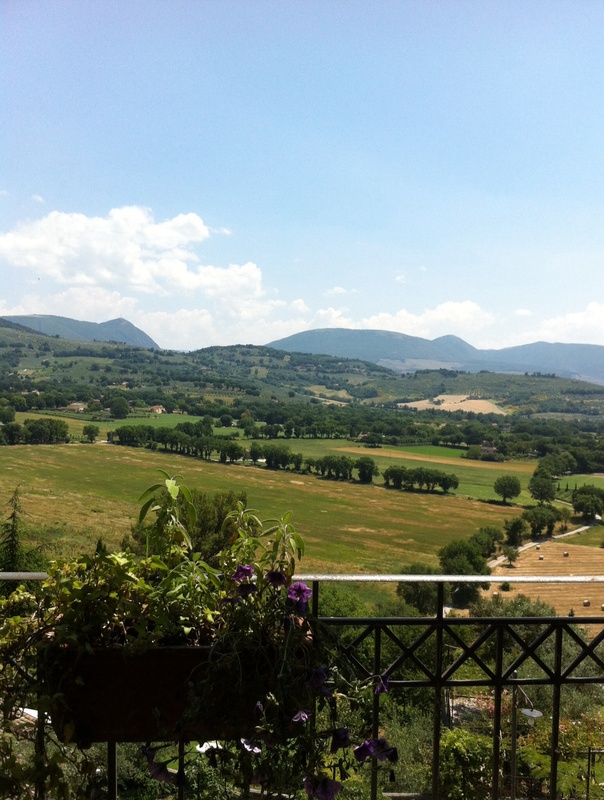 Lunch today was in Il Trombone, a rustic local trattoria with a stunning view from its terrace…. 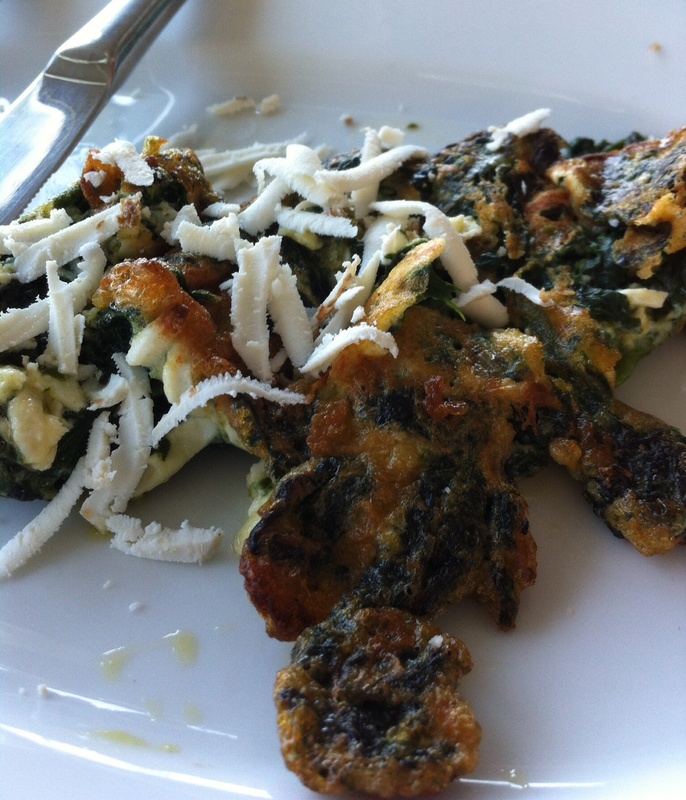 Muddled eggs with spinach and Parmesan to start…. 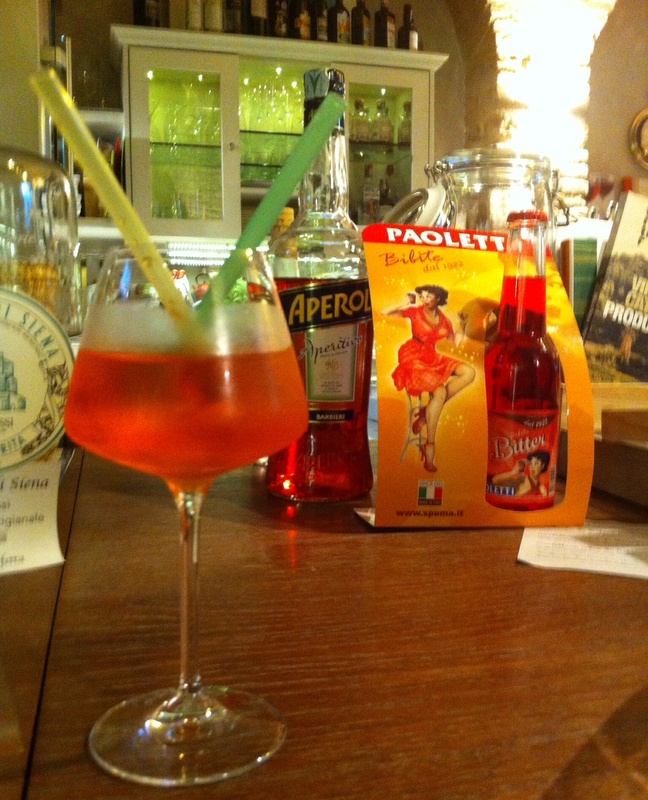 ….washed down with the usual suspects: red wine, vino rosso della casa, and water, a necessary coolant! What better menu choice is there when in Italy? 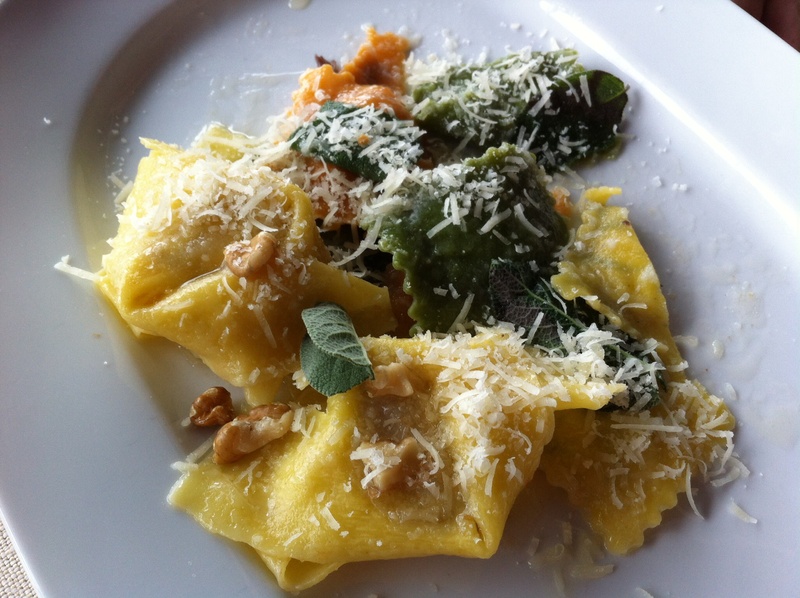 This ravioli with ricotta, spinach and sage was a feast for the eye as well as the stomach…. 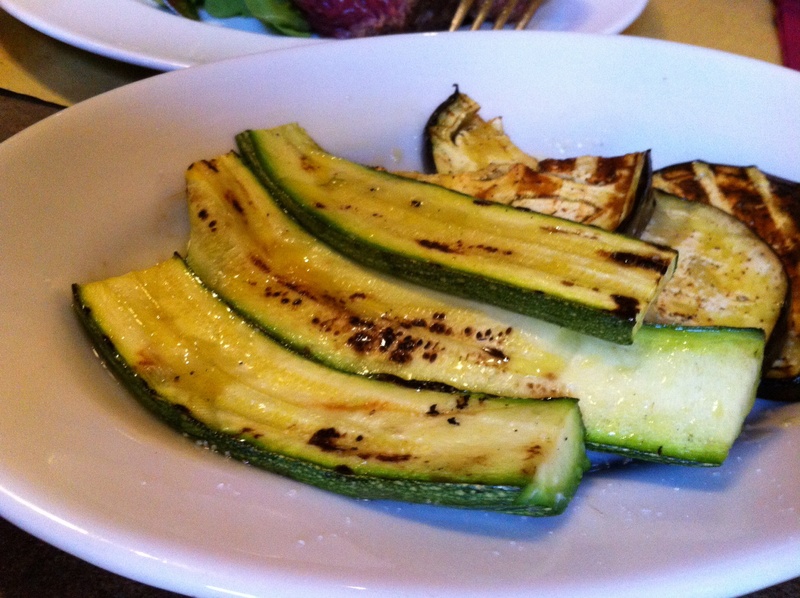 ….whilst this dish was stuffed with ricotta and walnuts: utterly delicious…. 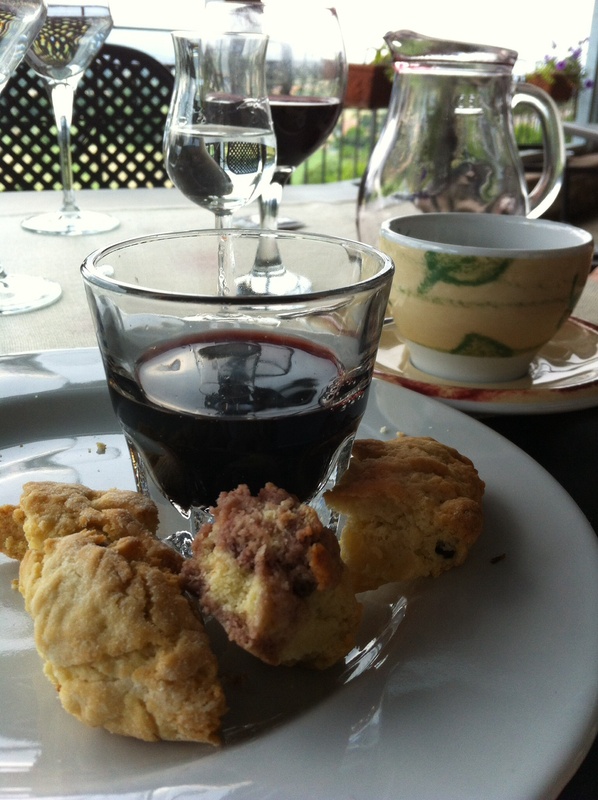 Leaving just enough room for passito e biscotti, a dark, sweet wine with nutty biscuits, grappa and coffee…. 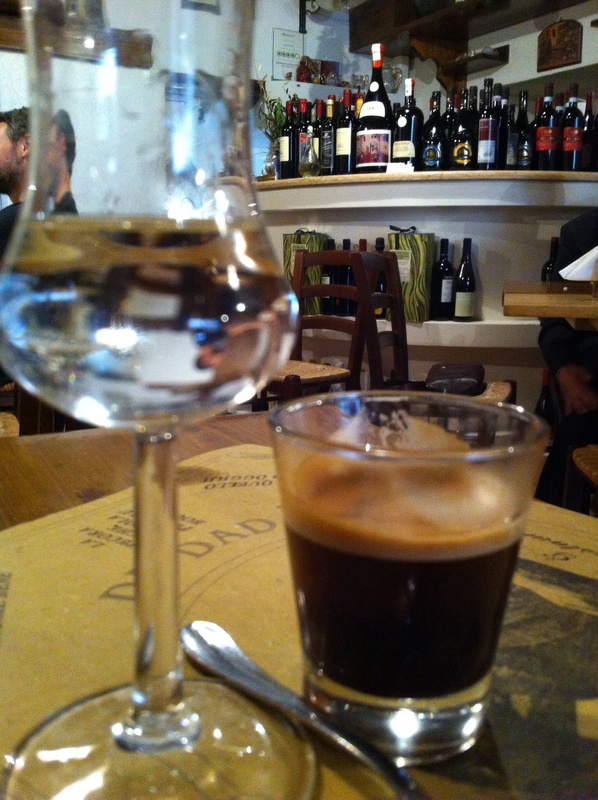 At the risk of sounding like lounge lizards, yesterday we ate at the Osteria de Dada. Here there is no terrace, no view and no menu. At least, there was a rather untidily hand-written menu outside, before you entered through the macrame curtain but, once inside, the food on offer bore little resemblance to that advertised. But that didn’t matter as the food was great. 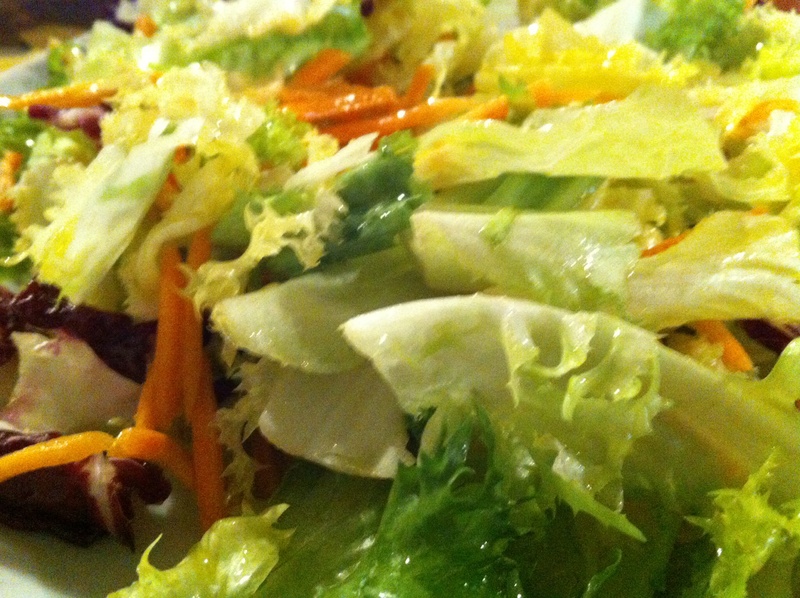 We started with salad, as a nod towards healthy eating. 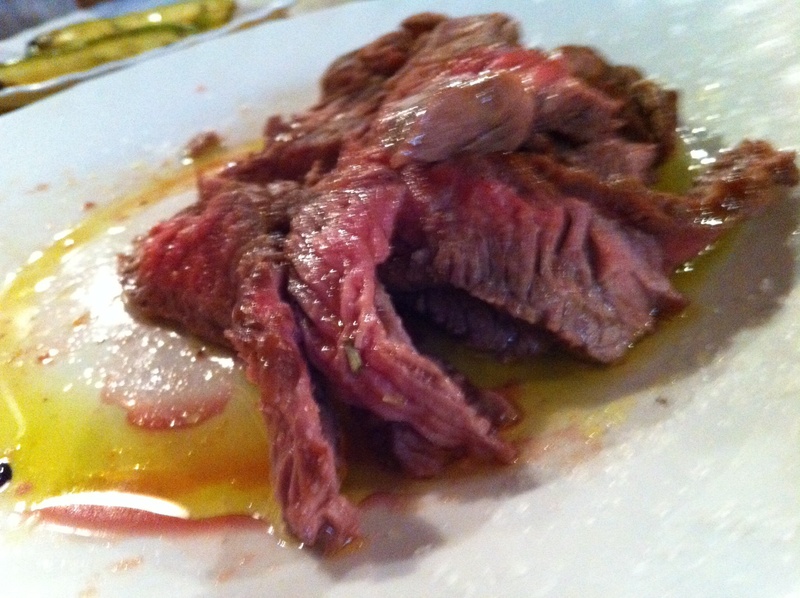 Deliciously crisp with olive oil and salt, it whetted our appetite for the next course of sliced, tender duck and fried veal…. 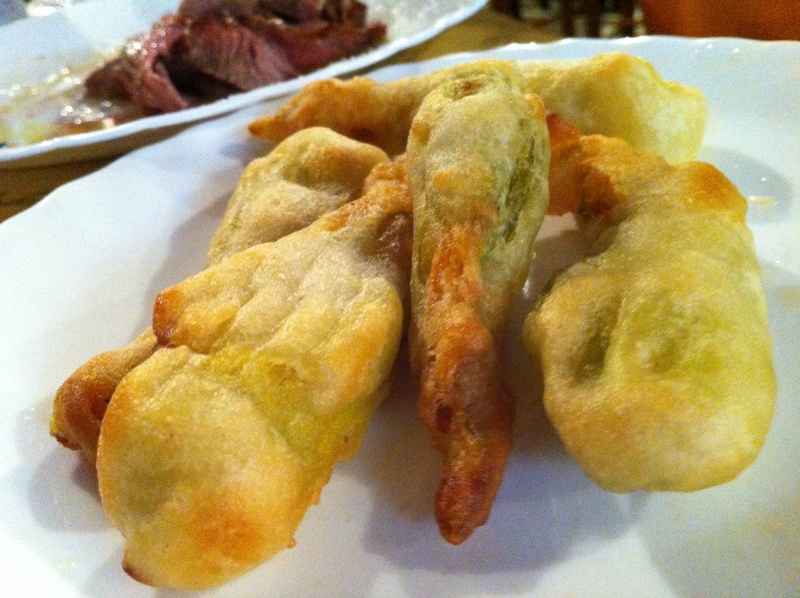 ….and, best of all, fried zucchini flowers…. But this meal had quite a funny ending, which I am rather embarrassed to relate. One of the two lovely ladies who runs the restaurant is habitually to be heard singing “O Sole Mio”. I really have no idea what came over me (I had drunk very little wine! ), but I joined in! As I didn’t know the words to the song, I spliced in a rousing chorus of “It’s Now or Never” in my most theatrical manner. (Have you ever noticed just how similar the tunes are?) Well, we got a huge round of applause from our fellow diners. But worse was to come! The chef pointed out that one of the diners was a Professor of Music. As I slunk back into my normal position of hiding in the background, he came over and congratulated me. It may have just been pity, but it was very much appreciated! We laughed all the way home…. 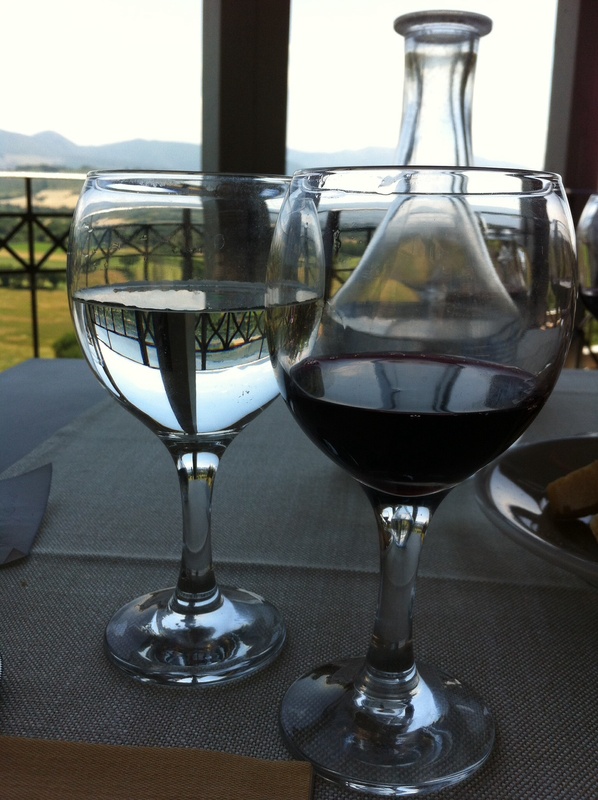 This entry was posted in Italian Life, Photography, Travel, Umbrian Food and Drink, Umbrian Hill Towns and tagged Dada's Spello, food and drink Spello, Il Trombone Spello, Spello on June 14, 2014 by maryshoobridge.